During the spring, salads provide hydration in addition to essential nutrients such as vitamins and minerals. Rich in enzymes, leafy greens help us with our digestion. Salads are a delight, attractive addition to any meal. 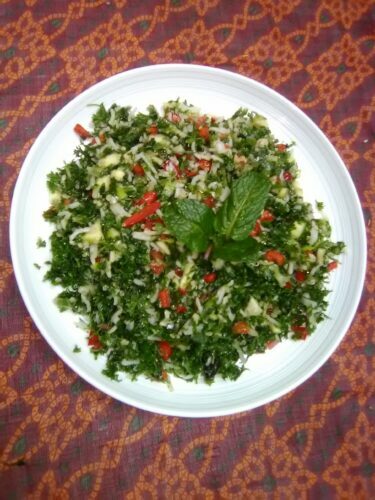 Tabouli, a Middle Eastern salad, creatively combines grains, leafy greens and finely chopped vegetables. It can be an ideal addition for picnics and cookouts. You can prepare the grains, the vegetables and the dressing ahead of time; store them separately in covered containers and refrigerate. When ready to use mix them and serve. Bulger, a wheat product, is used in a more traditional tabouli. This gluten-free option is made with rice and quinoa. Both basmati rice and quinoa cook in 12 to 15 minutes, so they make a wonderful combination. First cook the grains. Wash and drain both grains thoroughly. Bring the water to boil in a saucepan. Add the grains, oil and salt. Stir the mixture gently and bring it to a boil. Next, cover the pan and allow the grains to simmer gently for about 12 minutes or until all the water is absorbed. Keep the cooked grains covered for a few minutes. You will only need ½ to ¾ cup of cooked grains, as the main color and flavor of tabouli should remain leafy and green. (Left over grains can be refrigerated to be used in the future). Spread out ¾ cup of cooked grain onto a platter to cool. Place the dressing ingredients in a bowl and mix them well. Set the dressing aside. Next, prepare the vegetables as described in the list of list and combine them in a mixing bowl. Add the cooked grains as needed (upto ¾ cup) to ensure that the final product looks mostly green. 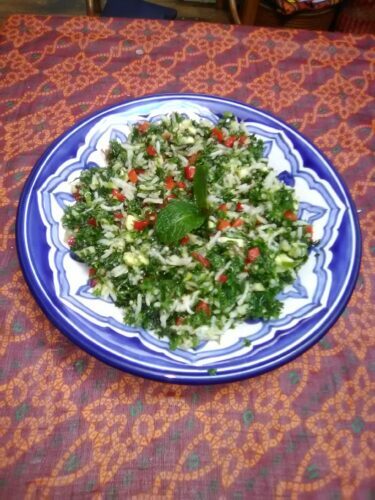 Add the desired amount of dressing to tabouli until it is moist and shiny; do not drench. Refrigerate any remaining dressing for future use. Variation: To make a more traditional tabouli recipe, soak ½ cup bulgur (cracked wheat) in a cup of hot water for half hour. (Bulger is a pre- cooked product, so you do not have to cook it.) Drain and press the bulgur in your fist (or use a cheese cloth) to remove water completely. Follow rest of the instruction above to mix the grain with other ingredients.